I happened to notice interesting cover art on The New Yorker from March 30, 2009. The illustration depicts miniature Yankee Stadium and Citi Field coming out of boxes with other miniature New York buildings in the foreground. Named "Opening Day," the over was created by artist Bruce McCall. 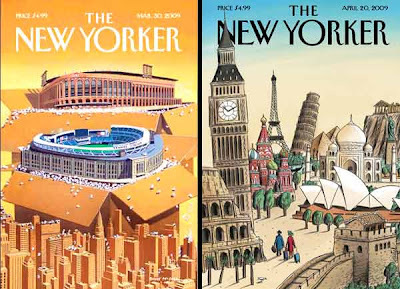 Another recent cover from April 20, 2009 depicts a compilation of famous world landmarks. Very cool architectural covers from the city-focused magazine.